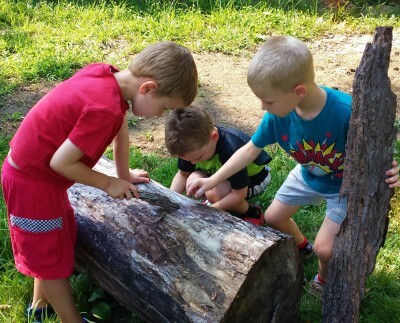 Luke’s Treehouse Child Care & Preschool Early Learning Center-Columbia, Missouri’s first Certified Nature Explore Outdoor Classroom! 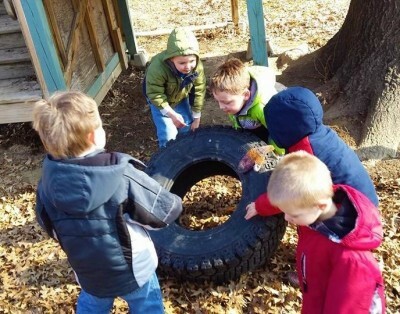 We designed the outdoor classroom to be a rich learning environment for year-round learning and exploration. It has plenty of room to run and play in the grassy area. 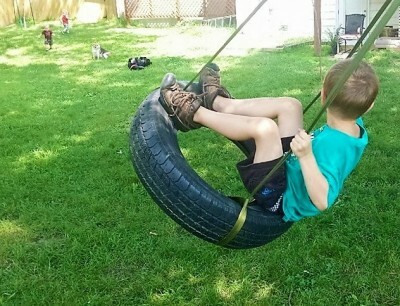 It has tires to climb and roll on and one to swing on. 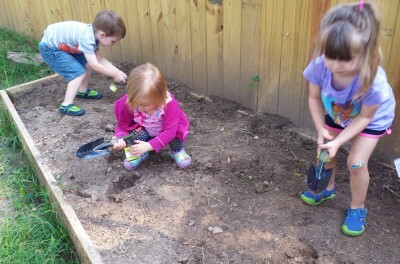 It has dirt and sand to dig, water to play in. 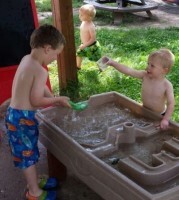 In hot weather, sprinklers and the water table and cold weather, snow for building. Our namesake, Luke’s Treehouse, now houses a new Nature Science Center which was partly funded by an educational grant. It is equipped with pictures of local and regional birds, animals, and other creatures. 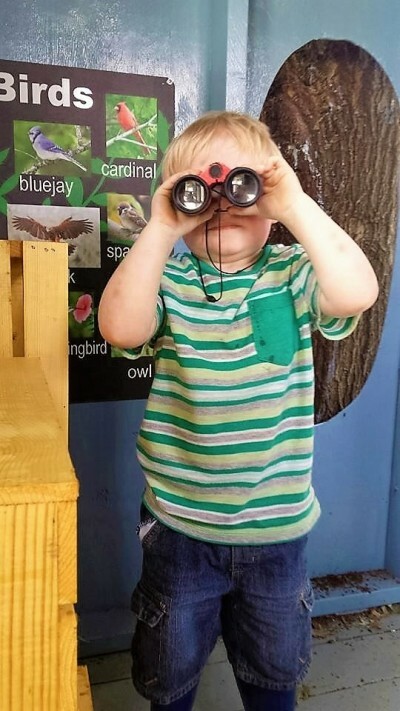 It includes items to use for closer examination like binoculars for bird watching, a periscope for peeking through the window, magnifying glasses, measuring tapes, a sorting tray, and a scale to balance and compare. It also includes natural items such as rocks, pine cones and shells to examine, sort, and create nature art. We made the space nature-friendly by installing 8 birdhouses, with bird savers that help prevent other birds or predators from robbing the nest, 2 bird feeders, a birdbath, and a squirrel feeder. We added 10 new trees on the property to go with several mature trees. 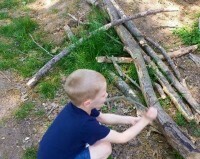 These provide a home to animals, shade our classroom, and provide leaves to rake and pile up to jump in. We planted 2 grape plants and a thornless blackberry bush, these may one day provide sweet treats. We also planted fragrant sage and other wildflowers in the entry courtyard near our path. 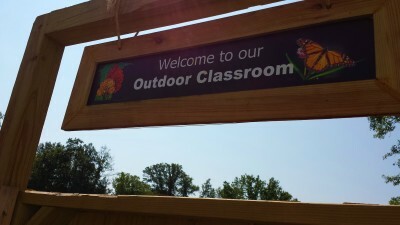 We added new furnishings and signage to the outdoor classroom. 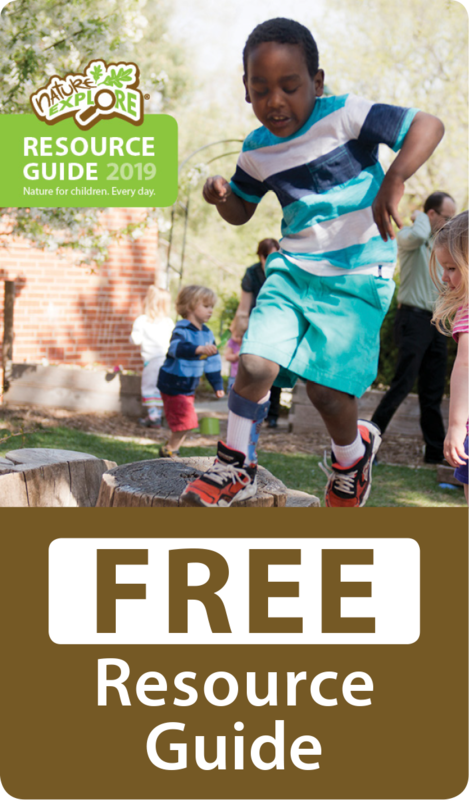 These include a literacy garden, with a chair and bench to read in among the forsythia bush, a block table, an art table, a standing planter box, and 8 red bird benches for workers, children, and parents to enjoy. We also built a tool cabinet near the dirt digging area for rakes, shovels, and hoes. The courtyard entry also has a private Little Free Library children’s book exchange for children to check out books with their parents when leaving school for the day. The outdoor classroom began as a great place to run and play and is now even better! I look forward to sharing this space with children and families for years to come and to enhancing this great outdoor learning environment by developing the plantings and the music, art, and building areas. We are off to a great start!